Was it good for the Native Americans to live in the missions? Was life in the missions ethical? Be sure to state your opinion for each question. Then, gather your supporting details to prove your point of view. Leave no unanswered questions for the reader. A good essay will state your opinions firmly and then provide such support that the reader will have no choice but to believe your point of view. Load up the proof for your opinion, choose words that will pound your point home and be prepared to answer any challenges that anyone posts in response. You can write this as one or two paragraphs. It might be best to have two paragraphs, one for each question. Also, check your writing for good spelling and good conventions (capitalization, punctuation, sentence structure and correct word usage). Keep in mind that your work will be online and readers from all over the world can read your ideas. Once you post your work, you won't be able to edit it. Use the information from your textbook. If you wish, you may also do some light research online to find other ideas to use. Be sure that you read other blogs and post a reply to it! It's always great when someone replies to something you have written! I agree, Calvin and Mike! It is very pretty. I agree that it is very beautiful. I agree with you Zoey. I think when the Native Americans moving into the missions was horrible because, having to move by being forced to is terribly wrong! Also being taken away from your parents! If I were there I would be terrified! I agree with you Zoey. I would be terrified too. I agree that the missions were horrible. I would not like it if got taken away from my parents. I would freak out and scream my head off. I would as well Rhys. I think it was horrible for the Native Americans to move and be forced to do so into the missions. It was also sad because the children were being taken away from their parents. The only positive things the missions provided were clothes, shelter and food. The negative things the missions did were make them work, take the kids and never let them leave. I think was unethical for the Native americans to live in the missions. Even though some of them liked living in the missions. Especially because the Native Americans had to eat, sleep, work and rest when they were told too. I think it was unethical for the Native americans to live with the missions, the Native americans had to learn things they didn't even understand! They needed to work for clothes, food and other needs. Native americans ALL worked, even children, the girls were segregated from they're familys, and they were locked in buildings. Some Native americans even tried to revolt the padres, some failed, and some revolts succeeded in the revolting. I truly, would hate living there. I agree with you that it was unethical because they would lock the girls in different buildings away from the rest of their family. I agree with you all the way.By the way nice use of a vocabulary word.For Lauryn. I agree and good way of saying why Lauryn! Why did they lock the girls in buildings and what were the buildings called? The locked the buildings so that the girls could not get out and escape to their families. The building was called a monjerio. No, I do not think that it was good for the Native Americans to live in the missions because, they didn't even ask for food or any other needs and yet they were forced to work for it and before the missions ,they were doing just fine. I also do not think that it was good to live in the missions because if you were going in just out of curiosity, you would not be able to get back out, so you were trapped in the missions. The Native Americans were forced to do certain things at certain times in the missions because of the mission bell. The mission bell told Native Americans when to wake up, pray, eat, rest, and work. Native Americans that entered the missions became slaves of the Spanish. Native Americans that lived in the missions had all of their beliefs taken away just like that, and were forced to become a Roman Catholic. No, I do not think that life in the missions was ethical because anyone under the age of 8 was taken from their families. That is wrong because that is hurtful to children that are under the age of 8 and they need their family. The missions were not fair because the Native Americans built the missions and yet they were treated terribly in the missions. The Native American girls were locked in a building every night called the monjerio (mohn her EE oh) to be kept away from their families. The Native Americans had to do all of the work at the missions. The Native Americans were beaten a great deal at the missions. The Native Americans were mostly forced to come to the missions by the missionaries. You said the Native Americans had to do ALL the work they did not have to teach the Roman Catholic that is a job right? I totally agree on why you think the missions were bad for the native americans! Well, it's not really a job because it is a requirement to the missions because that is mostly what the missions are about, to teach the Roman Catholic religion to the Native Americans. Thank you for replying :) :) :)! I agree with you about why the missions were bad. Did the girls have to be locked away because the Spanish wanted them to be apart from their families? That comment was to Leina. I do not think it was good for the Native Americans to live in the missions with the Spanish. All the girls had to go sleep in a monjerio, which is a place that the Spanish would lock up the girls in when they slept, so they would not escape to see there family because the girls would be kept away from there family. The Native Americans did get food and shelter but if they broke one of the Spanish rules they would get punished. The men had to work in the fields while the women were cooking and the girls were making candles and soap. The Spanish turned the Native Americans into slaves so I do not think the missions were good for the Native Americans. I think that the Native Americans should go back to where they once lived. Why would they lock the girls in the monjerio? I don't know why, but I bet it was sad being taken away from your family. How does the work of the men,women and girls that are Native Americans translate to the missions being bad? Maybe because the Native Americans did all the work. The missions were not ethical because the Native Americans did all work and got punished severely for not following one of the Padres numerous rules. Also, the Native Americans could never leave the missions and they had their children taken away from them to be baptized. To get their children back, they had to forget all their religious beliefs and be baptized. Finally, without the Native Americans building all the structures there would be no missions or even any Spanish settlements. I agree with you, but maybe the Spanish built the first missions. They couldn't lock the Native Americans in a mission without there being at least a main structure for a mission. I think it was not good for the Native Americans to live in the missions because they had to do all the work, but they did not have their freedom. The rules at the missions were very strict for Native Americans. For example, if a girl didn’t wake up on time, her mother would get punished and the girl would go to jail for a while. Also, girls had to live away from their families in a monjerio. Another reason that Native Americans didn’t like missions is that most of the Native American population died from the diseases brought by the Spanish. Additionally, the Native Americans had their children taken away after they were baptized and the only way to get them back was for the mother and father to be baptized which meant that the parents had to give up their religious beliefs. Also, the Native Americans hated the missions so much that eventually some of them decided to revolt, which wiped out some of the missions or lowered their populations. I think that that was amazing! By the ways why did they only lock up the girls in monjerios? I think that life in the missions was not good for the Native Americans because the Native Americans had to learn a new religion and they had to work all day. They had to change their clothes, their food and language. I don't think it was good to live in the missions. I think living in the missions wasn't ethical because the Spanish treated the Native Americans like slaves and slavery is unethical. I agree when you say that slavery was unethical. I also agree on why you think living in the missions were unethical. Life in the missions was bad for the Native Americans because in the missions the Natives couldn’t go where they wanted to go. In the missions everything was different. The Native Americans had different food, clothing etc. The Natives had to adapt to the new language and some didn’t like learning the language. They had to do almost all the work. It wasn’t ethical because it wasn’t right for the padres to imprison the Native Americans. The padres thought the Natives were ignorant and they wanted to make them believe in the Roman Catholic Region. The padres should just teach the Natives about the Roman Catholic Region. It was wrong to force them to come to the missions. how would they teach them without getting them to believe it first? I think they had to teach them to believe it. One reason the missions were terrible is that the missions would not let you go out into the world and could never return permanently to the way the Natives used to live. A second reason is that the girls had to sleep in a separate building away from their family! A third reason why is that the Native Americans had to do most of the work. But they earned food, clothing, and shelter. Also,they would force you to be baptized by taking children under eight so the mothers became baptized to stay with the children and so the father also became baptized. Why did the missions have girls sleep in a separate building from their families? I think that the missions were bad for the Native Americans because they were forced out of their homes to live in the missions.The Native Americans had to worship a strange and new god,eat different foods,and live a new life.Once the Natives went into the missions they were not allowed out again.Most of the Native Americans didn't like the missions but it is true that some did like the Missions.Although the the spanish exploited the Natives, they did have better technology,and education.Thats why some Natives might have liked the missions. I agree completely Emelia I don't think the Native Americans belonged in the missions. Brilliant! I really like how you typed it Emelia! I agree on why the missions were bad when you said that the Native Americans were forced out of their homes to live in the missions. But they were free when the missions closed, right? I think the native Americans living in the missions was horrible. I think one the worst parts of the missions was the monjerio. A monjerio is a place where the Spanish locked the girls at night so they wouldn’t run away or escape to their families. The positive things the missions did were supply the native Americans with food, shelter and clothing. The negative things the missions did were take the babies from their families, tell them what to do and when to do it and sometimes torture the native Americans so much they would run away. Also if someone broke the rules of the padres they would get punished severely. One of the rules was the girls had to be at the monjerio at a certain time otherwise the mother, if she had one, would be punished for detaining her daughter. Another negative side to the missions was that the mission bell rang telling the native Americans when to eat, sleep, pray, rest and work. That is why I think the missions were horrible. I agree that the missions were horrible when you said the Spanish locked the girls in a building at night so they couldn't run away from the mission. I think the that missions were unethical because of the way the missions ran. What I don’t like about the missions is that the mission bell rang telling the native Americans when to eat, sleep, pray, rest and work. Also is that the girls were separated from their families. They stayed in a building or buildings called monjerio or monjerios. At night the monjerio was locked so the girls couldn’t run away from the mission or escape from the mission or to their families. I wonder why the girls were separated from their parents. Also because the missions would make the native Americans work all day and then just torture them. I do not think it was ethical for the Native Americans to live in the missions. They did get food and shelter, but they were still turned into slaves by the Spanish. The Spanish locked the girls in a building called a monjerio when they had to sleep. They did that so couldn’t be with their family and escape. Being locked in a building, not seeing their parents, while the building could catch on fire. Also if they were allowed to do something at their tribe, so they did it at the mission, and the mission rules were that they could not do what they used to do, so they got punished in a bad way. That is not fair. The Native Americans didn’t know all the rules. I do not think it was ethical for the Native Americans to live with the Spanish in the missions. Awesome piece of righting Rhys! I agree with you on why the missions were unethical. But maybe after some time the Native Americans did learn all the rules. Life a the missions was NOT ethical for the native amaricans because the natives ha to work ALL DAY LONG!!! The natives thought it was mean to work all day, but the Padres thought it was good. Imagine work all day long. Sounds a lot like the Padres are into slavery. No.I do not think life in the missions was ethical.No,life at the missions were not good for the native californians.The native californians had to: Work all day,stay at the missions,girls were locked away from their families,they had to live under the punishments of the Padres. I like how you listed why the missions were not ethical. No, life was not good for the Native Americans in the missions because the padres forced them to believe their beliefs, eat their food, and work very hard. They also had to follow the padres’ rules or they would get punished and the punishments were very harsh. No, life was not ethical for the Native Americans who lived in the missions because they had to do everything the padre told them to do or they would get severely punished. Would the native americans eat the padres food or their own food? They would eat their own food but I meant they had to eat the same kind of food the padres ate. That is true , Ben! I think that some of the Native Americans didn’t like living in the mission. I think that the Native Americans liked being free to live where ever they wanted in the wild. They liked their own culture more than the Spanish culture in the mission. Some of the Native Americans wanted to run away from the mission so bad that one of them actually did. The Native Americans weren’t allowed to leave from the mission. The families were split apart and the daughters were forced to live in a small cottage. They were locked in at night The Native Americans even killed the padre and burned the buildings down. That’s how much the Native Americans didn’t like living in the there. Naomi, I agree that they wanted to go back to their old ways of living and that they were treated like slaves. Your blog was very well written. I agree, Catie. You did great Naomi:)! Did all of the Native Americans not like living in the missions? Did all of the Native Americans want to go back to their old culture? Life in the missions for the Native Americans was bad. In the Spanish in charge of the missions’ point of view, the missions weren’t bad at all. When the first mission was founded by Father Serra, he wanted to spread the Roman Catholic religion. In most of the Native American’s point of view the missions were torture. Some of them, who were born there, thought of the missions as home, but they had to build things, work in the fields, and do many other things for the Spanish. They were treated like slaves. The Natives weren’t allowed to wake up in the morning when they wanted. They had to wake up when they were supposed to, eat when they were supposed to, and go to sleep when they were supposed to. Life in the missions for the Native Americans was not ethical. The Spanish treated them very unfairly. When the Natives did something wrong they were punished seriously, sometimes even whipped. The Spanish turned the Native Americans into slaves by making them work every single day. If a Native was a girl, she would be locked away at night without her family in a building called a monjerio. If she didn’t show up when she was supposed to, the following day she would be locked up, and her mother would be punished if she was the reason her child did not show up. If the Spanish missions were ethical, girls would not have been locked away from their families, and the Natives would have the freedom to do what ever they wanted to do. NICE JOB CATIE THAT IS A LOT OF WORDS!!! Good job Catie. I like how you explained what happened if a girl didn`t show up at the monjerio. I really like how you typed that, Catie! I do not think girls having to live in a different building from there family was not fair! What do you think about that? I think that it was completely unfair also! I think it was unethical for the Native Americans to live in the mission. One reason why I think it is unethical for Native Americans to live in the mission is, once there in the mission they can’t go back to their tribe. Another reason why I think it is unethical for Native Americans to live in the missions is, they are taught like slaves. My third reason why I think it I think it is unethical for Native Americans to live in the missions is, they must wake up at a certain time, the must eat a certain time, the must sleep at a certain time. I agree on with you on why the missions were unethical. I agree with you, Alexis. You did great, Nolan! I agree when you said the Native American were being treated like slaves. Nice post! I think it was unethical for the Native Americans to live in the missions because they can’t do what they want to do, and they have to do what the Spanish tell them to do. If the Native Americans join the Spanish, then there is no turning back. They get treated like slaves, and they can’t go back to their own culture. Sense the Native Americans are getting treated like slaves some of them ran away. I think you did a good job to! When the missions closed, the natives could return to their culture. Many didn't. Do you know why? Some Natives might have wanted to live their own lives and explorer the earth! When the Native Americans were set free they didn’t know what to do. The missions were all they had done for several years. The Native Americans had to do certain things when the bell rang such as waking up, going to bed, praying and eating and didn’t know anything different. I think that it was not good for Native Americans to live in the missions because the Native Americans were put to work without any pay. The work was too hard. If you accidentally broke the rules, you were severely punished and that is bad. The missions were also bad because the Native American girls were separated from their families. Once you were lured in, you were not allowed to go out of the missions. There was no escape. Native Americans being forced to live and work at the missions was unethical because it was against their will and they didn't like it. They were forced to put behind everything they learned and believed. The Spanish basically made the Native Americans into slaves and the Native Americans were not allowed to resist. NICE JOB KIRAN!that is very nice righting. Nice job Kiran! Great blog. The Native Americans were not allowed to resist, but did they anyway? I agree when you said that life was unethical and the Native Americans were being treated like slaves. But they got paid by food and shelter, right? Great question, Mr. La Marr. Yes, the Native Americans did resist by revolting. Many of them died fighting the Spanish. I forgot to put that in my blog post. Yes, John F. they got paid with food and shelter. PS that was a terrible home for the Native Americans. I do not think it was good for the Native Americans to live in the missions because they had to work for their clothes and food. They had to understand a language they didn’t even know. They had to give up the religion that they had believed in for their whole life. The girls were separated from their families and taught a new religion called the Roman Catholic religion. The Spanish baptized the children under eight years of age. This caused their mothers to get baptized and the child’s father to get baptized. The father and the mother got baptized because the wanted to be with their child or children. It was unethical for Native Americans to live in missions because they went from free to basically becoming a slave. It was like a prison for them. A bell rang telling them when to wake up, eat breakfast, lunch and dinner, and when to go to work. They got beat if they broke a rule. After the Native Americans got to leave they had nowhere to go because all of their tribes had died from the Spanish diseases. I would not have liked to live in a mission. Nice Job it is very nice! Well detailed, well organized and well supported blog, Christian! You prove your side well! Great job Christian for adding that the Native Americans died from Spanish diseases at the end of your blog post. But the Padres rang the bell, did they not? I agree it was unethical. Great blog! I agree with you Nolan. The Native Americans were treated like slaves! thank you Christian,the Spanish did spread diseases! I agree with you to Kiran the Native Americans were treated badly. Yes they were treated badly especially because of how the mission bell ran the Native Americans lives. I agree with you to Blake the Native Americans were treated like slaves. I think it is not fair for the Native Americans to live in the missions. One reason why I think it is not fair for the Native Americans to live in the missions is, they have to do all this work but when they are in the Indian tribe they don’t have to do so many things. When the Native Americans are in the missions they can get diseases and die easily. Great job Nolan! I agree with you and Mr. La Marr! Also the diseases the Spanish brought from Europe killed half of California`s population. I think the missions weren’t good for the Native Americans because they were forced to live there. The Spanish stole the Native’s land where their tribes lived. Instead of living free they were captured and baptized into the Catholic religion. They also needed to work to get food and clothing. The Native Americans also needed to learn a whole different culture! They had to learn strict rules too, if you disobeyed the rules there were bad punishments. The Native Americans also had to be taught Spanish to learn the work they had to do in the missions. The Natives were also affected by the diseases that the Spanish people carried, most Natives died. There was a bell that told the natives when to eat, sleep, or work so they could keep track of what to do. Life in the missions was very different from the Natives way of life. The Natives were captured and could not go back to their way of living. The Natives were forced to work and were treated like slaves. I think that being forced to work is unethical. Life in the missions was good when the Spanish knew the cure for the diseases. The Spanish also educated the Natives to learn a new culture, new religion, and new language. Good, well thought out post, Katie. So, overall, was it ethical for the natives to live in the missions? I don't think the mission life was ethical. I think life was not ethical. It was not ethical said once the Native Americans entered they were not let back out. It was not ethical when the Mexicans said the Native Americans had the change their religion. The Native Americans were fine with their life before they were in the missions so they wanted back to their old life. The Mexicans were making a act of slavery to the Native Americans. I fell like the Native Americans were being treated like slaves when the Mexicans told them when to eat, sleep, wake up, and work by the mission bell. It was not good for the native American when they got exposed to the Mexicans disease, so one of two Native Americans died. I also think it was not ethical, and nice writing Declan! I argee Declan the Native Americans could not get out of the missions when they come in. great job Declan, lot's of the word ethical. I do not think life in the missions was not ethical. First of all the Spanish should not have exploited the natives unless they would like to be exploited themselves. Also,the Spanish treated the natives like their property, whipping them, and treating them like animals. Humans are humans and they have the same rights. I think you that you are correct the missions being unethical when you said that humans are humans and they have the same rights. You are right. All humans have the same rights. I also think they were treated like property,Emelia. I agree Amelia, the Natives were being treated like property.All humans are humans and they should have the same rights. I think it was unethical for the Native Americans because they were free and then all of a second they are now a slave. A bell called the mission bell rang telling them when to wake up eat breakfast, lunch, and dinner, and when to work. If they broke a rule then they would be beat up and the other consequence was a huge , harsh punishment. Many Native Americans died because of the Spanish diseases. I would not have liked to live in the missions. Life was not ethical in the missions for the natives. The natives got to roam wherever they wanted. Now they had to live under the padres rules. They have to follow something when the mission bell rings. Natives now had to learn spanish. They were treated like slaves. That is why i do not think life in the missions were ethical. It was not good for the natives because they were trapped in the missions. Did they get to roam free when the Native Americans were in the missions? I agree Justin it wasn't good for the natives. Nice Job!I agree on how you said the mission was unethical! I think life for the Native Americans in the missions was terrible. First, the Native Americans didn’t get to go back to their old lifestyle when they entered the missions. Second, the Native Americans did much more work than the Spanish, who started the missions, and they built more of the mission than the Spanish did. Plus, the girls had to live separate from there families. Third, The Native Americans couldn't decide when to eat, play, work, pray, and sleep; the mission bell did. In conclusion, life for Native Americans in the missions was terrible because they had no control over their own life. It was terrible terrible terrible. I would miss my old style hometown. I agree with all your detales Tommy I also like how you put all your great detales. I don't think it was right for the native ameracins to live in the missions. If they did even one tenny tiny thing wrong they got punished. They had to do all the work, and the Spanish did none of the work. That is why I think missions were not right. Mission life isn't ethical. I would have to sleep away from my mom, dad, and my little sister. I agree with you but I think the Spanish did do some work. What about teaching the kids in school or teaching the Native Americans the Spanish beliefs? exactly, Alexis. The padres had to teach them how to do the work. It was not good for native Americans to live in the missions because they had to work everyday and had to work for their own food. If a native american tried to leave a mission often a soldier on horseback would go after them. The girls learned to make candles and soap from tallow. The boys helped in the fields and kept animals from eating the crops. The women made cloth from wool, prepared the meals, wove baskets, and made many other things that were needed. Men grew crops in the fields. So the native Americans technically worked for everything they needed. Another bad thing for the Native Americans in the mission was that they would get punished if they did something wrong. An extremely bad thin g for the Native Americans was that if they stepped into the missions they would never come out. That caused the padres to capture all the Native Americans because they did not want them wandering around the country not knowing what to do. It was not ethical for the Native Americans to live in the missions because they would have to work all day long and also for all the people that lived in the mission and including themselves just to actually live. The Native Americans made food, clothes, shelter, and other things for the padres and the Native Americans. Were all of the natives captured in the missions? Nice job,i agree with what you said. I think life at the missions was the worst for the Native Californians because they helped keep the mission working but they got punished if they made a mistake even if it is was very small. In my opinion Father Serra the founder of the first mission does not deserve good credit for what he did. There were twenty-one missions in all. Father Serra founded nine of twenty-one missions. The Native Californians were already living fine until the missions. The Native Californians got lured in the missions mostly out of curiosity. Some jobs for the Native Californian men were to grow crops and to take care of the animals. The women had to make cloth, prepare food and weave baskets. The boys kept the animals away from the crops so they would not eat the crops the men grew. The girls made candles and soap from cow fat. The ringing of the bell told them when to do things like eat or sleep. The girls were kept away from their families at night in a building called a monjerio and locked in so they couldn’t escape. If a girl returned late to get locked in her mother would get punished for keeping the girl with her. To get the Native Californians to get baptized to be Roman Catholics the Spanish baptized the infants and children under eight so the older children stayed with mothers. The mothers wanted to get baptized if their young children got baptized. Now the men’s families have gotten baptized. 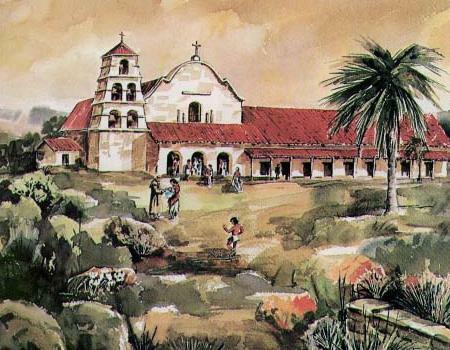 The Spanish successfully baptized almost all the Native Californians at the missions. Great blog Ana! I agree with the part when you talk about the natives getting baptized. It was not good for the Native Americans to live in the missions. One reason is that in the missions Native Americans were forced to eat, sleep, drink, work, and pray at a certain time. Another reason is that you would think that they got free food from the padres, but would you consider it 'free food' if you knew that the Native Americans had to work all day starting at age 8? Well I wouldn't. If you disagree, please post your opinion. Life in the missions was not ethical. Native Americans were treated as low level citizens (treated like dirt). The missions were also an example of slavery because the Native Americans were forced to work all day and had no time to themselves. They couldn't even keep their own culture! Instead they had to learn and believe the Roman Catholic Religion. If I were a Native American, I would have been so angry and I would have wished I hadn't ever entered the mission. That brings me to another point. Once a Native American walked into a mission, they could never return permanently to their tribe. That is kind of sad for the Native Americans who were so curious about the new architecture, food, people, goods and most of all, new culture. Nice job John,I like how you said they treated the Native Americans like dirt. the mission bell told the Native Americans when eat,sleep,drink,work and pray. good question but the padres rang the bell, right? great blog John, I like it a loooooot!!!!!!!!!!!!!!!! I do not think it was fare for Native Americans to live in the missions. One reason why I think Native Americans shouldn’t live in the missions is, when they are released most of their tribes were wiped out from diseases. My second reason why I think Native Americans shouldn’t live in the missions is, when they lived in the missions there was torcher and that’s not fare. Sometimes people are curious and they go in the missions and they can’t get out so they have to go through all of the hard work. I agree Nolan it was not fair for the Native American's to live in the missions. I think it wasn't good for the Native Americans to live in the missions. The Spanish THOUGHT they were bringing in a new way of life, but the Native's were already living perfectly fine. Plus, the Spanish MADE the Native's believe a different belief. That's what we do in RL! Lots of ideas for everyone to read! Great job, 4th graders! I do not think it was ethical to own a mission because the natives had their own belief and religion and culture. Spanish had no right to take your life you used to live. Good points about the fact that the natives had their own beliefs, religion and culture. Keep showing us your great ideas, Tavia! No, it was not the right choice for all of the Native Americans to live in the Missions. If the Native Americans wanted to live there but changed their minds once they got there they couldn’t leave. If any Native Americans tried to run away from the Missions, the Missionaries chased the Native Americans with a horse and then beat them a great deal. The Native Americans had to live under the rules and punishments of the padres. The ringing of the mission bell told them when to wake up, pray, eat, rest, and work. One of the punishments was if a Native American brought her daughter late at the monjerio the daughter would get punished for being careless and would get locked up for being late. All of the Native American girls had to get locked up for the night in the monjerio so the Native American girls would not escape at night. In the Missions, children would have to be younger than 8 to get separated from their family but if they were 8 and up they would get to stay with their parents. Newborn Native Americans are unable to learn their family history. Living in the Missions was unethical because the Native Americans did not get paid for their hard work because they did not have the freedom to get paid for their hard work. The Native Americans became slaves because the Native Americans did all of the hard work while the Missionaries just sat there and watched the Native Americans work for most of the day. Some Missionaries looked out for run away slaves day and night. All of the Native Americans did not have the right to practice their old ways. The Native Americans also did not have the right to do their old traditions. Reason 1. It was not fair that the missionaries treated the Native Americans very poorly and made them do all the work. Reason 2. Once the Native Americans entered the Missions they could not get out. If they tried the Native Americans would get brought back and beaten up by the Missionaries. Reason 3. All of the Native American kids would have to be nine and up to not be separated from their family. AWSOME MAX, THATS A LOT OF WRITING! I agree with what you said. You have summarized all the information very well Max! This is a blog post that teaches other people about life in the missions! Well done. you have a humungus blog max. Good blog Max I agree that it was unethical for the Natives. I think the missions was so not fair! I think that because, the Native Americans had to do all the dirty work. Second of all, the Natives could not go out of the missions. So the Natives could not escape. The native Americans were stuck there to do all the hard work. The only positives were there food, shelter, and clothing. The Native Americans would be forced to live in the missions. Pretty much everything was different for the Natives like food, shelter, and gods. great blog Zoey, great job puting all those detale's! I agree with you on why you think the missions were not fair. But what when the Natives went out into the fields. Sorry. There was supposed to be an about between what and when. There was also supposed to be a question mark at the end. The mission system is a group of 21 missions in the southern coast of California, from San Diego to San Francisco. They were the settlements that the Franciscans made to convert the locals to their religion and way of life. The missions were supposed to be one day apart; that means it would take one day to get from mission to mission. The missions looked like big churches with lots of crops and mule stations. They grew crops such as corn, wheat, and other grains. They had animals such as cows, chickens, and some other farm animals. They didn’t have fences to keep their animals in. They occasionally had some Native American structures and houses so some of the Native Americans could go to bed outside of the missions because there wasn’t quite enough space. They made the missions attractive to Native Americans by making the missions fancy. They taught the Native Americans their language so that the Native Americans could understand them. Then they taught the Native Americans the Catholic religion. They gave the Native Americans new clothing and new kinds of food. Then they forced the Native Americans to make the missions. The Spanish made the Native Americans do everything for them. This was the start of slavery in America. The Native Americans were forced to do everything the Spanish said. They forced the Native Americans to build the missions. They had them do the chores they assigned them instead of what they wanted. The Native Americans had different assignments. The girls would make candles and cloth. The women would make the clothing and food for all the other people. The men planted the crops and stored the food for everyone. Since there weren’t any fences, the boys had to make sure no critters were eating their crops and make sure none of the animals were getting away from the mission. If I was a Native American I wouldn’t have gone in any of the missions in the mission system. It would be a terrible life where you weren’t free. They worked all day. They got bossed around by a bell according to the different ring tones and how many times it rang. This told them what they were supposed to do such as go to lunch, go back to work, and maybe have a five minute break. They weren’t free because they were using the Native Americans as slaves. They worked all day because they had to work on the crops, keep all of the animals near the missions, make all the candles for the night after that day, make all the meals, and probably only get occasional breaks. I would not go in the missions. Instead, I would stay the way I was so I could be free. I would run around and hunt for food. It could be fun to fish, in a way, because I would try to use one of the tools that Native Americans used to spear a fish. That would have been a lot better life. I do not think that the life in the missions was ethical and that nobody deserves to be treated the way that the Native Americans were treated. Life was not good for them because it did not matter to the New Spaniards if the Native Americans wanted to stay at the missions or not. It also wasn’t fair to them because they were forced to forget their old cultures and beliefs and had to learn the new Spanish cultures and beliefs. The revolt against 3 missions is enough proof to prove that life was obviously not good for most of the Native American slaves. I have four reasons why life was not good for the Native Americans. The Native Americans had to learn new cultures, languages, and so on. The Native Americans had to live under the cruel rules and punishments of the Padres. The Native Americans were curious about the missions at first and they went inside, but it wasn’t fair to the Native Americans just because of who they were. They never got to go back to the way they use to live. The last reason why life was not good for the Native Americans was because if one had been 8 or younger they had to be separated from their parents, and that is not right at all. great blog Jackson, I like how you put in all those detales.